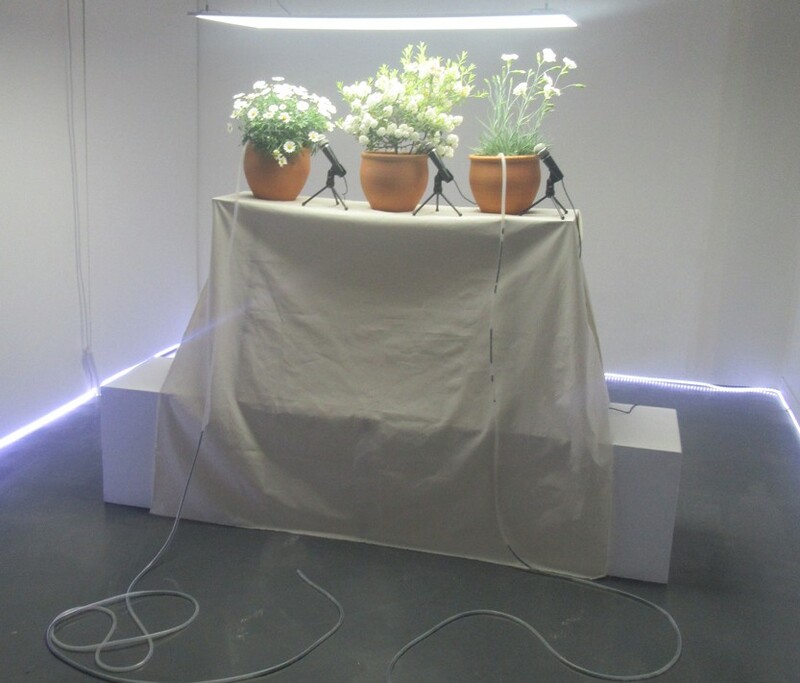 Emergency Conference (For Joseph Beuys), Dr Victoria Walters, 2016 Materials: Argyranthemum frutescens, Dwarf Rhodedendron ‘Arctic Tern’, Dianthus ‘Mojito’, hand-thrown terracotta pots, calico, table, microphones, soil, plastic tubing. I would say that without art man is inconceivable in physiological terms…. I would say man does not consist only of chemical processes, but also of metaphysical occurrences. The provocateur of the chemical processes is located outside the world. Even the act of peeling a potato can be a work of art if it is a conscious act. It looks at life and living. The reason? Because it is my contention that a more rounded view of life enriches work-a-day lives and increases the respect and appreciation for life in general (more so than with a highly focused approach). Obviously, I do not claim that what is offered here will be complete and totally balanced even within a particular angle. And certainly not all possible angles could be covered here; that would be an impossible task. I happen to hold the view that the study of plants provides an excellent starting point to study ‘life’. And, I put forward the suggestion that someone who develops a wider and deeper understanding, and a consciously directed awareness of (and involvement with) plant life, is likely to achieve a healthier and more fulfilling life (evidenced by having an increased vitality and living longer) by tapping into the very copious life forces that plants seem to either possess or have access to. By putting this intuitive view forward I hope to provoke discussion and experimental investigation into this possibility.